Home » Safety » Which Car is Really Safest? Which Car is Really Safest? Throughout the 90s and even into this century, truck based SUVs were all the rage. Gas was cheap. The marketing was impressive. Even though most are used for commuting back and forth to work and never taken off-road or used for towing, the ability to plow through any terrain was a big selling point. I haven’t been stuck in the snow in 25 years of driving front-wheel drive vehicles in northern Illinois, yet many people here still insist they need 4WD. Of course, they forget 4WD and AWD do nothing for braking or stability and often wind up in the ditch first! Sadly, many people also had the impression big SUVs were safer than cars, too. After all, they were bigger, heavier, taller and the frames were more rigid. Who cares that they often lacked crash test results, head restraints, shoulder belts and key safety features? Who cares that rigid meant that more energy was transferred to the passenger, rather than absorbed by a crushing frame? Who cares that taller and heavier meant a higher center of gravity and more rollover risk? Who cares that they often had antiquated suspensions with inferior handling and braking? Who cares that more mass doesn’t help you in side impacts, the most deadly type of crash to properly restrained passengers? Part of the problem was that it was impossible to compare vehicle safety from one class to another. Frontal crashes do depend on mass, so the results were not directly comparable. Many models, especially trucks and SUVs, went untested by the NHTSA and/or IIHS and lacked key crash ratings. The effect of emerging safety features like stability control and side airbags was not yet known. Many publications made efforts at a composite safety ratings, from Consumer Reports to insurance companies to auto and finance magazines. All had pretty major flaws. Some arbitrarily weighted some crash tests highly while all but ignoring others. That led to tiny cars with some pretty mediocre crash ratings getting a recommendation based on safety. Others omitted either NHTSA or IIHS results completely in favor of the other, even though the results are complementary. Some gave top ratings to models that received high scores on a few results, but lacked results in all the other tests. Only later did buyers find out those other results were poor! This type of arbitrary composite score did not benefit anyone, except perhaps the manufacturer of the models that did well at the expense of the models that were actually the safest. Enter www.Informed For Life.org, a small non-profit organization founded by Michael Dulberger. Though the big agencies and publications with massive resources have still failed to produce an overall safety rating, a tiny non-profit organization has done it with minimal funding and staff. Basically, Informed for Life considers everything. All the NHTSA crash ratings, all the IIHS crash ratings, weight (for frontal crashes), rollover risk and even important safety features like stability control and side airbags. Best of all, the weighting of these isn’t arbitrary; it is based on actual statistics. They even include all the equations and a calculator! No mysterious good ratings for mediocre vehicles here. To make this very long blog a little shorter, this is the website to visit when you are comparing overall safety among vehicles. Given that traffic injuries are the #1 killer of children and adults through age groups up to 34 years old (and among the top unintentional injury causes for all ages), this should be an important consideration for every family vehicle. The catch? None really. Of course, there is always the issue of vehicles that haven’t been tested by the IIHS or NHTSA, yet. Sometimes these agencies are quite slow at releasing results and this is not the fault of Informed for Life. Until these results are available, Informed For Life gives a vehicle a “typical” score for models of its class as a placeholder. The rating may well go up or down when a new result is released, so you still need to check to see which ratings are included and if any are missing. Sometimes, the Informed For Life database is missing a result that is available or just hasn’t been updated for new results. In this case, you can use their simple calculator and enter all the information yourself! Again, no secret on how this is done, it’s all explained on the website. How to interpret the results? The ranking lists are based on a SCORE that attempts to normalize the risk of fatality. The list is large and ordered by model year. I liked the older format that had separate lists for each year and also showed you which results were included and which ones were missing, but the new format does have all the model years in one file. Most models on the first couple pages from each model year should be good choices for safety. That correlates to a SCORE of around 80 or lower for the safest vehicles. The only exceptions to this would be those models that are missing more than one or two ratings from the IIHS or NHTSA. So, it is important to check for missing ratings, especially for the newest model year! How do you find out what ratings are included for a model with the new list format? That’s also easy! Just use the tool below! While it’s a shame that such a tool wasn’t created by the NHTSA, IIHS, Consumer Reports or another organization 10 or 15 years ago, it’s great that we have it today. It’s also great that the death trap truck-based SUVs of the 1990s have been replaced by some extremely safe crossover SUVs that are based on car platforms. The Ford Explorer and other SUVs generated a lot of safety related publicity less than 10 years ago. 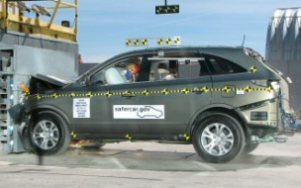 Today, the Ford Taurus X and other SUVs are among the safest vehicles on the road! So, kudos to consumers and automakers for making the right choices! It’s not expensive, either. Models like the 2008 Kia Sedona, Hyundai Veracruz, Ford Taurus sedan and Chevy Malibu are also among the safety elite, so you no longer need to buy a luxury model for safety, either! Even without Informed For Life, there is no secret to buying a safe car. 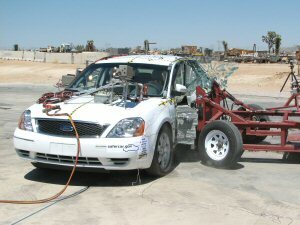 Simply choose a model that has a full set of crash tests. Avoid models with any “3-star” or lower result in the NHTSA. Avoid models with any “Marginal” or “Poor” rating from the IIHS. The more “5-star” and “Good” ratings, the better. Then, make sure the trim level you buy has both stability control and side curtain airbags. If not, find one that does or order these critical features as an option. Just those simple steps will result in a reasonably safe model. There is also no secret about how to greatly reduce the risk from the #1 killer of kids. Choose a vehicle with a full set of ratings and a SCORE under 80. Properly restrain your kids in an appropriate rear seating position. Put down the cell phone and drive undistracted/unimpaired. That’s it- your family is now quite safe while riding in your family truckster. Wonderful article, Darren, and a good new resource to know about! Your readers might want to know that Safe Ride News publishes a fact sheet, “Choosing a Vehicle for Family Safety.” This is a handout for community education programs. We’ll consider adding Informed for Life to our resources section, as we update the fact sheet for 2009.